With innovations, fresh data, and lessons learned from recent earthquakes, scientists have developed a new earthquake forecast model for California, a region under constant threat from potentially damaging events. The new model, referred to as the third Uniform California Earthquake Rupture Forecast, or "UCERF3" (http://www.WGCEP.org/UCERF3), provides authoritative estimates of the magnitude, location, and likelihood of earthquake fault rupture throughout the state. Overall the results confirm previous findings, but with some significant changes because of model improvements. For example, compared to the previous forecast (UCERF2), the likelihood of moderate-sized earthquakes (magnitude 6.5 to 7.5) is lower, whereas that of larger events is higher. This is because of the inclusion of multifault ruptures, where earthquakes are no longer confined to separate, individual faults, but can occasionally rupture multiple faults simultaneously. The public-safety implications of this and other model improvements depend on several factors, including site location and type of structure (for example, family dwelling compared to a long-span bridge). Building codes, earthquake insurance products, emergency plans, and other risk-mitigation efforts will be updated accordingly. This model also serves as a reminder that damaging earthquakes are inevitable for California. Fortunately, there are many simple steps residents can take to protect lives and property. The Uniform California Earthquake Rupture Forecast, Version 3 (UCERF3) is a comprehensive model of earthquake occurrence for California. It represents the best available science for authoritative estimates of the magnitude, location, and likelihood of potentially damaging earthquakes in California. Two kinds of scientific models inform decisions of how to safeguard against earthquake losses: (1) an earthquake rupture forecast tells us where and when the Earth might slip along the state’s many faults, and (2) a ground motion prediction model estimates the ensuing shaking from a fault rupture. UCERF3 is the latest earthquake rupture forecast for California. UCERF3 was developed by the 2014 Working Group on California Earthquake Probabilities (WGCEP), a multi-disciplinary collaboration of leading experts in seismology, geology, geodesy, paleoseismology, earthquake physics, and earthquake engineering. The development of UCERF3 involved numerous public meetings and included formal evaluations by five separate review panels. The study was led by the U.S. Geological Survey, the Southern California Earthquake Center, and the California Geological Survey, with partial financial support from the California Earthquake Authority, which is the largest provider of homeowner earthquake insurance in California. The development of earthquake rupture forecasts by the WGCEP (in 1988, 1990, 1995, 2003, and 2007) shows progress towards more accurate representations of the very complex California fault system. Video of UCERF3 results, showing the fault segments (over 350) used in the model. What is improved or innovative about UCERF3? UCERF3 includes more than 350 fault sections, compared to the 16 and 200 faults considered by the WGCEP in 1988 and 2007, respectively. As detailed geologic data about the history of earthquakes and locations of faults is limited in many parts of California, UCERF3 has incorporated analysis of the gradual movement of hundreds of locations throughout California using space-based geodesy (GPS data) in order to estimate rates of deformation for faults lacking geologic data. Recent events demonstrate that earthquakes can rupture beyond previously understood fault boundaries, resulting in a much larger fault-rupture area and magnitude than expected (e.g., 2010 M7.2 El Mayor-Cucapah; 2011 M9 Tohoku, Japan; 2012 M8.6 Sumatra). Scientists now recognize that faults are not isolated, but instead are often interconnected in a broad network or “fault system”, where multiple nearby faults can occasionally rupture simultaneously. Unlike previous models, UCERF3 accounts for the possibility of these multi-fault ruptures. A “grand inversion” was developed for UCERF3 to solve the rate of all possible earthquake ruptures in the interconnected California fault system. This new system-level approach also draws upon a broader range of observations to arrive at the solution. By employing the “grand inversion” technique, the resulting UCERF3 forecast rate for moderate-sized earthquakes (magnitude 6.5 to 7.5) is more in line with the observed rate in nature. All previous earthquake rupture forecast studies for California estimated a much higher rate for these moderate-sized events than compared to the observed rate. Calculating the UCERF3 “grand inversion” results required the use of supercomputers to cover a broad range of models (>5,000), each considering more than 250,000 fault-based earthquake possibilities (including multi-fault ruptures) throughout California. The same calculation would take more than 8 years on a single desktop computer. After a fault ruptures, it takes time for tectonic stress to re-accumulate on that fault – a concept known as Reid’s elastic rebound theory (Reid, 1911). UCERF3 includes this notion of fault “readiness” in the earthquake rupture forecast. Faults are more likely to rupture (more ready) where tectonic stress has built up over many years without an earthquake. Conversely, faults are less likely to rupture (less ready) when and where a recent earthquake has occurred. We may not know when the most recent earthquake occurred on most faults in California, but we can assume it was before reliable recordkeeping began (in 1875). By accounting for this “historic open interval” for events prior to 1875, we can quantify fault readiness throughout the entire California fault system, unlike previous studies that were limited to only a subset of faults with well-known histories. What are the major findings of UCERF3? UCERF3 results (southern California shown here) are viewable within Google Earth. Click to download the KMZ file. UCERF3 confirms many previous findings, but it sheds new light on how future earthquakes will be distributed across California and how big those earthquakes might be. Greater California. UCERF3 shows the likelihood of moderate-sized earthquakes (magnitude 6.5 to 7.5) is lower, while the likelihood of larger events is higher when compared to the UCERF2 results. This is because UCERF3 includes the possibility that multiple nearby faults may occasional rupture together to cause larger earthquakes. The increased rate of these larger earthquakes must be balanced by a decreased rate of lower-magnitude events in order to maintain the overall plate tectonic, fault system budget. The estimated rate of earthquakes around magnitude 6.7 (the size of the destructive 1994 Northridge earthquake) has gone down by about 30 percent. The expected frequency of such events statewide has dropped from an average of one per 4.8 years (in UCERF2) to about one per 6.3 years (in UCERF3). The likelihood that California will experience a magnitude 8 or larger earthquake in the next 30 years increased from about 4.7% in UCERF2 to about 7% in UCERF3. Southern California / Los Angeles Region. 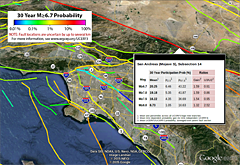 The UCERF3 model estimates a greater increase in the likelihood of larger earthquakes in the Los Angeles Region compared to most of California, because the region has more faults that can host multi-fault ruptures. UCERF3 concurs with previous studies that consider the Southern San Andreas Fault the most likely to host a large earthquake. 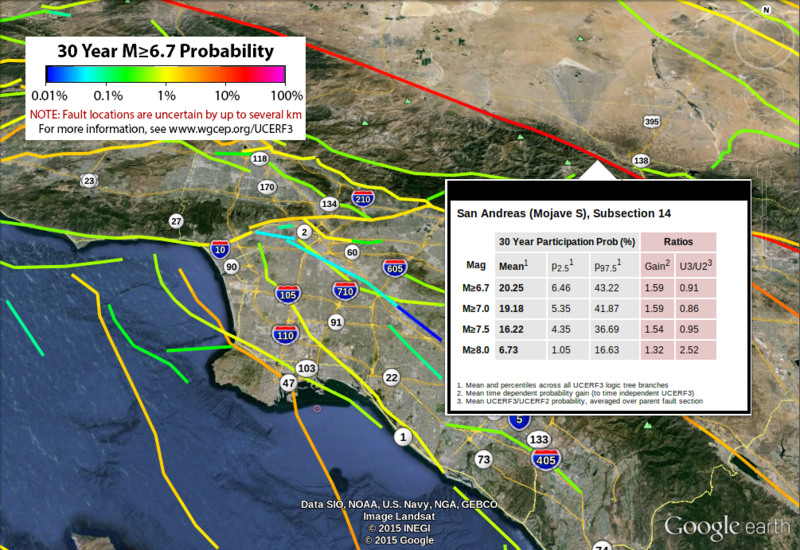 Compared to UCERF2, the likelihood of M≥6.7 earthquakes on the San Jacinto Fault decreases three-fold in UCERF3, but is balanced by an equivalent increase in likelihood of M≥8 earthquakes on that fault. Northern California / San Francisco Region. The Northern San Andreas Fault has a lower likelihood of hosting an earthquake (compared to the Southern San Andreas) partly because of the relatively recent 1906 earthquake on that fault. The Hayward-Rodgers Creek and Calaveras Faults are more likely to rupture (compared to the Northern San Andreas) because it has been a long time since the last earthquakes occurred on these faults. Compared to UCERF2, the Calaveras Fault shows a three-fold increase in M≥6.7 earthquake likelihoods, but no compensating decrease in rate at higher magnitudes. This is because most events on the Calaveras in UCERF2 were well below magnitude 6.7, so the inclusion of multi-fault ruptures in UCERF3 increases the likelihood of all M≥6.7 earthquakes. UCERF3 can be combined with ground motion prediction models to ascertain the seismic hazard, or ground shaking generated by each possible earthquake rupture. These seismic hazard estimates, coupled with engineering models of the built environment, are used to ascertain seismic risk, or the probability that humans will incur loss or damage to their built environment if exposed to a seismic hazard. UCERF3 has been used for the 2014 update of the U.S. Geological Survey National Seismic Hazard Maps. The California Earthquake Authority will use UCERF3 to evaluate insurance premiums charged to customers, as well as their own level of reinsurance. UCERF3 will be used for other risk mitigation efforts for years to come, including engineering design of building and lifelines, loss estimation for catastrophic bonds and other risk-linked securities, and emergency preparedness – all to increase public safety and community resilience. What are the limitations of UCERF3? It is difficult to make generalizations about the hazard or risk implications of UCERF3 without first specifying both asset types and their locations. Conclusions will vary depending on whether you are designing a single family dwelling, retrofitting a bridge, considering the location of a power plant, laying pipeline across the San Andreas Fault, or considering aggregate losses over a large insurance portfolio. The practical implications will need to be considered on a case-by-case basis. How can we prepare for future earthquakes? Through the National Earthquake Hazard Reduction Program (www.nehrp.gov), the U.S. Geological Survey and its partners will continue to conduct research aimed at improving our understanding of fault behavior and estimates of earthquake hazard in the future. UCERF3 should also serve as a reminder that California is earthquake country, and residents should always be prepared. Simple safeguards include practicing “drop, cover, and hold on,” securing items in your home and workplace that could fall during an earthquake, and storing seven days’ worth of food and water. Homeowners can also consider structural retrofits, such as bolting the house to its foundation, as well as earthquake insurance options. For further guidance on how to prepare for, survive, and recover after big earthquakes, follow the Seven Steps to Earthquake Safety (www.earthquakecountry.org/sevensteps). Where can I find additional information about UCERF3?